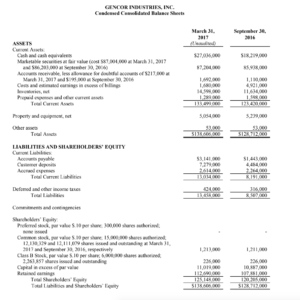 May 5, 2017 (PRIME NEWSWIRE) – Gencor Industries, Inc. (Nasdaq: GENC) announced today net revenue for the quarter ended March 31, 2017 increased $448,000 to $22.5 million from $22.1 million for the quarter ended March 31, 2016. Gross margin was 29.6% for the quarter ended March 31, 2017 compared with 24.6% for the quarter ended March 31, 2016. Selling, general and administrative expenses decreased $63,000 to $2,127,000 for the quarter ended March 31, 2017, from $2,190,000 for the quarter ended March 31, 2016. Operating income for the quarter ended March 31, 2017 was $4.1 million compared to $2.9 million for the quarter ended March 31, 2016. The Company had non-operating income of $0.8 million for the quarter ended March 31, 2017 compared to non-operating expense of $(0.3) million for the quarter ended March 31, 2016. 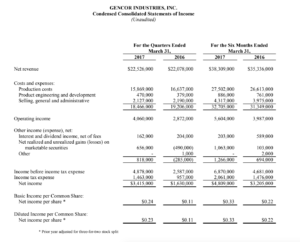 Net income was $3.4 million, or $0.24 per basic share and $0.23 per diluted share, for the quarter ended March 31, 2017, compared to $1.6 million, or $0.11 per basic and diluted share, for the quarter ended March 31, 2016. For the six months ended March 31, 2017 the Company had net revenue of $38.3 million and net income of $4.8 million ($0.33 per basic share and diluted share) versus net revenue of $35.3 million and net income of $3.2 million ($0.22 per basic and diluted share) for the six months ended March 31, 2016. At March 31, 2016, the Company had $114.2 million of cash and marketable securities compared to $104.2 million at September 30, 2016. Net working capital was $120.5 million at March 31, 2017. The Company has no short or long term debt. John E. Elliott, Gencor’s CEO, commented, “We are pleased with the company’s continued strong performance. We have been expanding our manufacturing production to meet the increasing demand for our equipment, without sacrificing operating income. Second quarter net revenues of $22.5 million do not include $4.1 million of revenues that will be recognized in the third quarter. These revenues include product that was finished but not shipped until April and contracts that did not reach the required percentage of completion level to be recognized in the quarter. Despite higher steel prices, gross margins significantly improved to 29.6% from 24.6%. The 500 basis point increase is attributable to a more efficient operation and full absorption of overhead. Operating margins of 18.0% are the highest quarterly margins in the Company’s history. Gencor is benefiting from a dedicated and well-trained workforce, producing equipment that has a reputation for superior quality. The March ConExpo-Con/Agg show was a tremendous success, generating strong leads some of which have closed and others we expect to close. Backlog of $42.9 million increased 35% year to year and is at the same level we otherwise started the fiscal year. Historically, backlog declines in our second and third quarters as orders are usually filled and new orders are not received until the fall and early winter months.